But I digress. What I meant to write about here, lest I forget the ingredients or the idea in all the multitude of things that happen every day, was the idea for a salad I ate when I was the hotel earlier this month. The chef(s) had basically tossed together chunks of pineapple with paneer and pomegranate and added some salt and red chilli flakes to season it. For some reason, the salad had acquired a bitter taste by the time I took some on my plate. But I think if one were to make it carefully, ideally this combination would make for a great and very different kind of salad, a pretty and colorful addition to the table. In fact I intend to make this one of these days and will probably leave out the chilli flakes and add some roughly chopped mint leaves for an extra dash of color. This is another recipe adapted from “Tikkas & Kebabs”, one of the “Chef’s Special” series published by Lustre Press in India. I have wanted to try this one since a long time because of the very clear memory I have of the delicious mint-flavored chicken tikkas I ate once in a restaurant in Delhi. 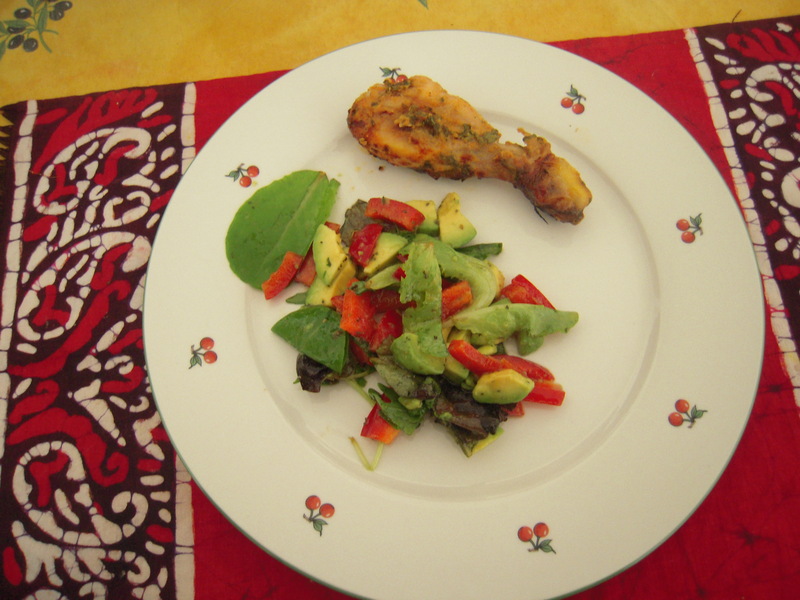 The girls loved this dish, when I cooked it for lunch last Wednesday. When I told the boulanger about it – I wasn’t able to take any for him to taste because the girls and I polished it all off – he seemed to like the idea of it and has agreed to try it one Tuesday soon, instead of the usual tandoori chicken. Mix the ginger and garlic pastes with the salt and lemon juice. Skin the chicken, make 3-4 incisions on each piece, toss the pieces thoroughly in the lemon juice mixture and leave them in this marinade for 30 minutes in a large bowl. In the meanwhile, strain the water in the yogurt by leaving it in a fine sieve for 15-20 minutes. Mix the rest of the ingredients – except the butter – in the yogurt. Add this mixture to the chicken pieces and coat them well in it. Leave the chicken in this marinade for at least 8-1o hours, turning over the pieces once during this time. Heat the grill to about 240 degrees Celsius, then place the chicken on a wire rack and grill till done (this takes about 40 minutes in my oven), turning the pieces over a couple of times during this time to make sure they are evenly cooked and basting with butter each time. I love the mild but distinctive flavor of herbs here. Last night, dinner consisted of exactly the same combination that Ma often made for dinner in the winter when we lived in Bokaro – vegetable soup, with these aloo-filled bread rolls on the side. Ma never served these rolls on salad leaves, but I guess I felt that a few leaves from the bag of mesclun would stop me from thinking about the significant amount of oil which the bread must have soaked up when I fried the rolls ! I actually made these as a sort of trial-run, since I wanted to take a couple to the boulangerie. This is another of Pooja’s suggestions and has been a winner too. Next week’s order from the boulanger is for these rolls and vegetable korma. I did, as planned, hand over bread rolls and korma for 10 to the boulanger this morning. But I have spent the last few days wondering if this has really been such a good idea, to introduce the girls to this snack (well alright,my own tendency to over-indulge once the rolls are made has been worrying me too). The combination of bread and potatoes which is then deep fried is surely not a recipe for good health. I did substitute white bread with multi-cereal bread but then commercial versions of the latter are not the real deal at all. Then, in what must surely be a Sign, a news story that highlights once again the problems with high glycemic index foods – of which potatoes and white bread are common examples -caught my eye first thing this morning. 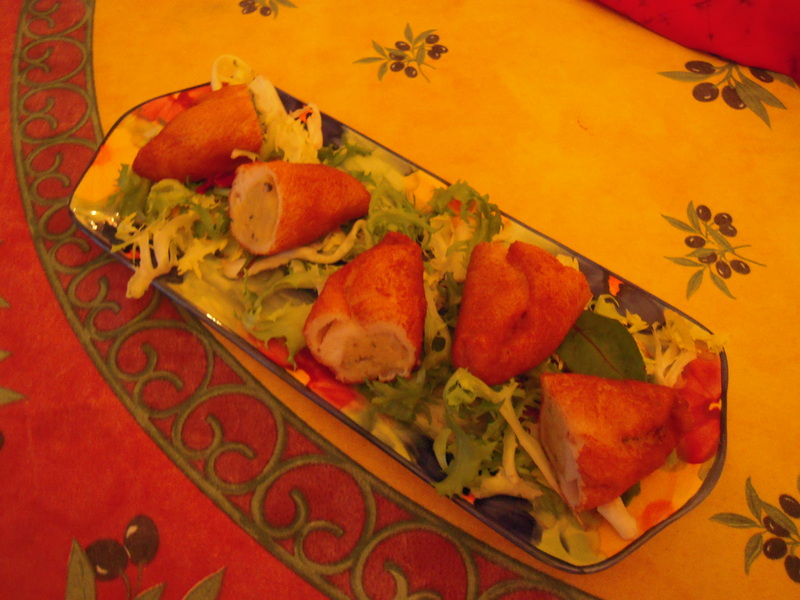 So while I fried a few rolls – which have been hugely popular with the girls – this evening for gouter – with the leftover potato stuffing, I decided that I am not going to include this particular recipe here. They’ll just have to call me for this one, if they do remember these rolls when they are older. For my part, I am not going to make these again in a hurry ! For the first four days this last week, it rained “elephants and hippopotamuses”, as the girls said. So we had soup for dinner quite often, and one evening we had pakoras as well, since it was just the sort of weather when I enjoy them most. I happened to have some coriander and mint chutney left over from a lot that I made a couple of weeks ago so we polished off the pakoras with that. Noor likes it a lot too, especially with dhokla. Wash the herbs thoroughly, then chop roughly after removing the hard stalks (I always retain the softer stems, instead of using only the leaves; it seems a waste to let the stems go since they have so much flavor too). Peel and chop the onion in to 6-10 large-ish parts. Blend together all the ingredients, using as little water as possible. This will therefore take time, since you will have to stop every once in a while to keep the machine of the food processor from overheating, and to stir the contents of the bowl/jar in which you are making the chutney. But it is worth spending the time rather than using too much water, since that would result in a watery chutney. Also, add the sugar and lime juice gradually, so that you can control the amount you will use of each, depending on the balance of sweet and sour tastes that appeals to you. This is such a tangy treat with so many different things; besan ka cheela, pakoras, batata vadas and, yes, in sandwiches too ! At one point during these summer holidays, I found myself utterly exasperated with cooking the same things again and again. I happened to mentioned this to Jenny and told her that I was in desperate need of recipes that would be quick to cook and suited to the weather in terms of the cooking effort (low) and style (light, non-greasy, not spicy). At this she was good enough to loan me, among other recipe books, her copy of Delia Smith’s ” Summer Collection”. I have made some changes to the original; here is my version. Combine all the ingredients for the vinaigrette then pour it on to the potatoes while they are still quite warm (the original recipe therefore requires that baby potatoes be used. Cook these with the skin on and add the dressing as soon as the potatoes are done, after draining the cooking water) and mix well. Add the spring onions and the chives next, and mix the salad again a couple of times. This is simple and delicious, with lots of subtle flavor. As I watched Indira happily polish off the remains of the yoghurt in Noor’s pot (Noor, who hasn’t been too well, had already gone in for her sieste without finishing her lunch) after finishing her own, I was reminded once again of how Mataji, my maternal grandmother, used to call me “dadhipriya”, because I loved yoghurt so much. I see the same fondness for this food in Indira too. It took me a while to figure this one out , that she was talking about pudina raita. So although it is a fairly cold winter day here, I thought I’d document this recipe too, since she loves this “sauce” so much. Of course, it is best eaten on a hot summer day, since the mint has such a cooling effect. Whisk the salt and the sugar in to the yoghurt. 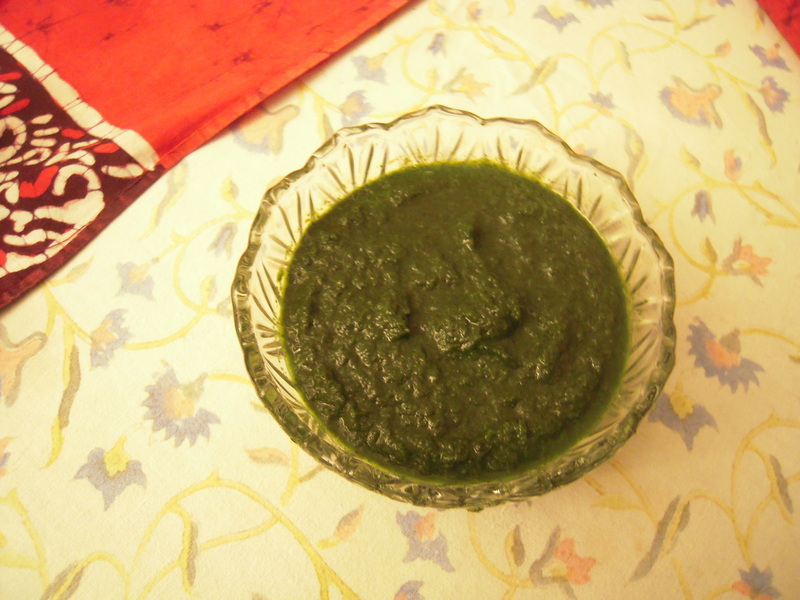 Mix in the mint leaves, and then turn the raita in to a serving bowl and leave for an hour or two before eating, so that the flavor of the mint blends well with the yoghurt. This raita is great with pulavs, paranthas, and heavy and spicy curries and meats. And it is a wonderfully cooling and fresh addition to meals in the summer. Atto – my husband’s bua – is one of the best cooks I know. What makes her food more special though, is the care and affection with which she feeds people. Wash the herbs thoroughly, then chop roughly after removing the hard stalks (I always retain the softer stems, and don’t bother about using only the leaves; it seems a waste to let the stems go since they have so much flavor too). Also, you could add the tamarind and jaggery pastes gradually, so that you can control the amount you will use of each, depending on the balance of sweet and sour tastes that appeals to you. I just love this chutney; I find the use of tamarind instead of lime juice quite a great touch.